Dr. Robinson grew up in Waynesboro, Va. and attended Wilson Memorial High School in Va. He went on to attend UNC-Charlotte, where he majored in Spanish and Spanish business. Prior to Veterinary school he received his certification in dog training at Triple Crown Dog Training Academy in Tx. Dr. Robinson attended veterinary school at the University of Pennsylvania, in Philadelphia, graduating in 2010. After veterinary school he completed a one year rotating internship at the Veterinary Specialty Hospital in Cary, NC. 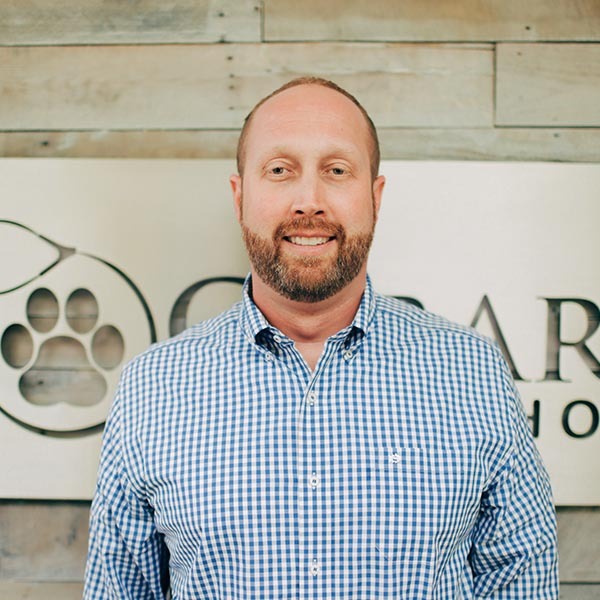 Dr. Robinson started working at Cabarrus Animal Hospital in 2000 as a kennel attendant/ veterinary assistant, rejoined the practice in 2011 as a veterinarian, and then went on to purchase Cabarrus Animal Hospital with his business partner, Blake Peurifoy, in 2014. He has a special interest in the Spanish language, and has taken many trips Central and South America to where he provides veterinary care to remote populations. Dr. Robinson and his wife Danielle were married in July of 2012 and they have a son, Avett Bayes. Dr. Robinson also has 2 dogs, Rollins a Doberman and Noche a black Chihuahua. With any down time he enjoys traveling, exercising, boating, all things UVA and Carolina Panthers, concerts, and being a foodie!